Marine microbial eukaryotes are ubiquitous, comprised of phylogenetically diverse groups and play key roles in microbial food webs and global biogeochemical cycling. However, their vertical distribution in the deep sea has received little attention. In this study, we investigated the composition and diversity of the eukaryotes of both 0.2�μm and >3 μm size fractions from the surface to the hadal zone (8727 m) of the Mariana Trench using Illumina MiSeq sequencing for the 18S rDNA. The microbial eukaryotic community structure differed substantially across size fractions and depths. Operational taxonomic unit (OTU) richness in the >3 μm fraction was higher than that in the 0.2�μm fraction at the same depth. For the 0.2�μm fraction, sequences of Retaria (Rhizaria) were most abundant in the surface water (53.5%). Chrysophyceae (Stramenopiles) sequences dominated mostly in the samples from water depths below 1795 m. For the >3 μm fraction, sequences of Dinophyceae (Alveolata) were most abundant in surface waters (49.3%) and remained a significant proportion of total sequences at greater depths (9.8%, on average). Retaria sequences were abundant in samples of depths ≥1000 m. Amoebozoa and Apusozoa sequences were enriched in the hadal sample, comprising 38 and 20.4% of total sequences, respectively. Fungi (Opisthokonta) sequences were most abundant at 1759 m in both size fractions. Strong positive associations were found between Syndiniales (mainly MALV-I and MALV-II) and Retaria while negative associations were shown between MALV-II and Fungi in a co-occurrence analysis. 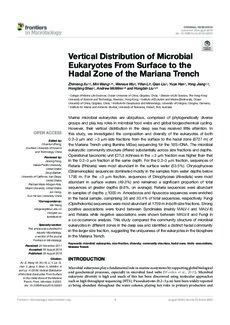 This study compared the community structure of microbial eukaryotes in different zones in the deep sea and identified a distinct hadal community in the larger size fraction, suggesting the uniqueness of the eukaryotes in the biosphere in the Mariana Trench.